In London locals and foreigners are confronted with excessive traffic, noise and large crowds. Along with numerous foreign expats, the city also attracts some 30 million tourists each year. Below is a picture of the current solution which is text based, representing a challenge for those who don’t speak English. What’s more even English speakers could benefit from a symbol based solution, as cognitively the brain interprets symbols quicker than text. For ex-pats and tourists the UK’s road system can be an unfamiliar one to master. Cars, lorries, buses and bicycles are driven on the opposite side of the road and while there are road markings that state which way to look before crossing, they are all written in English. For foreign nationals who don’t read English, resisting looking in the direction they would in their home country and trying to decipher what the road marking says is a lot to process in the very short space of time spent on the curb side. An extensive study was carried out in 2008 using London Helicopter Emergency Medical Service’s (HEMS) trauma database to examine the number of incidents involving overseas visitors from January 1st 2000 to 31st August 2007. The study revealed that international visitors to the UK have higher injury mortality than residents. Of the 9,571 HEMS missions that responded to pedestrian collisions with a vehicle during 2000-07, 61% involved international visitors compared to 16% of missions to UK residents. The study’s findings showed that HEMS missions involving pedestrian accidents are disproportionately more common among the visitor population to London. While the report doesn’t examine whether looking in the wrong direction is the cause of pedestrian accidents, this factor is strongly suggested. Of patients whose nationality was recorded, 95% of those injured or killed were from countries that drive on the right hand side of the road – a compelling statistic that is difficult to attribute to anything other than lack of awareness about the rules of Britain’s roads. This group are at greatest risk of pedestrian accidents and with international visitor numbers expected to rise to 40 million a year by 2020, finding a way to improve road safety is extremely important. It is not only international visitors who are at risk of pedestrian accidents, though. 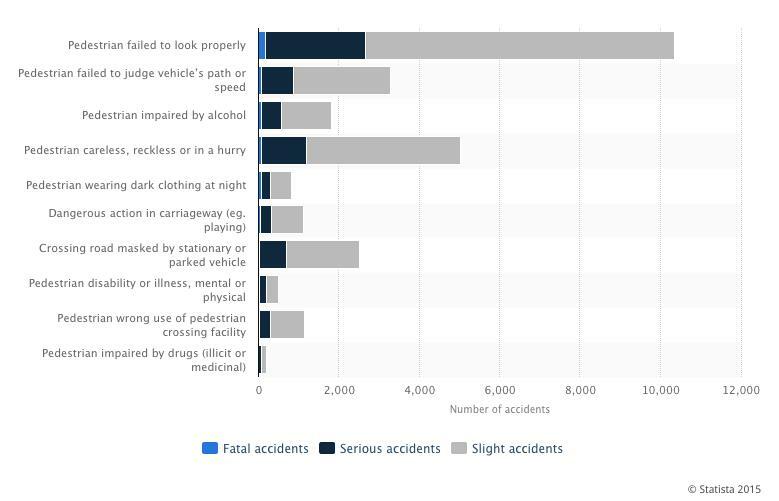 A 2013 annual report on Reported Road Casualties in Great Britain reveals that in 59% of accidents in which pedestrians were injured or killed the reason was because the person ‘failed to look properly’. Furthermore, in September 2015 the charity The Institute of Advanced Motorists (IAM) released figures that showed that failing to look properly or being “careless, reckless or in a hurry” were the two most common pairs of contributory factors reported together by the police attending the scene of an accident in 2013. The aforementioned statistics make a strong case for the improvement of the UK’s current road safety strategies. There are many measures that can be taken to prevent pedestrian casualties from occurring which include flashing road studs to alert drivers to the presence of the crossing, widening crossings and upgrading zebra crossings to pelican or puffin types. 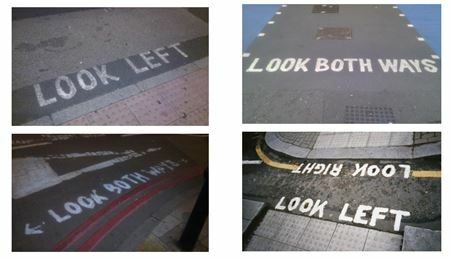 These, along with “writing on the road surface reminding foreign tourists to look left/right as appropriate” are outlined in a report on pedestrian fatalities produced by the Transport Research Laboratory for Transport for London. It is the proposed measure to improve and increase writing on the road surface that we are most interested in addressing. The use of arrows is inconsistent and they are often painted without a stencil. In some cases, the paintwork is in poor condition and the words are spread over a large surface area. Without the presence of an arrow at all, the road markings are rendered useless for those tourists that can’t read English and for bilingual participants whose mother tongue isn’t English, their cognitive processing is slower and less accurate than monolinguals. Improvements are needed to focus an individual’s attention span quickly and easily in a hectic environment, and assist the millions of foreign visitors each year by removing the language barrier on the road. Our solution is a symbol, an instantly recognizable sign that can be understood universally and prompt immediate action. The purpose of a symbol is to communicate meaning. When it comes to communication, cognitive development begins when we are very young – before we are able to speak, read or write. The news that child road deaths and serious injuries have risen for first time in 20 years, increasing by 3% from 2013 to 2014 and costing the NHS £547 million annually, means that the instinctive capacity to recognise symbols developed from childhood should be taken seriously. The natural affinity humans have for images and symbols goes back centuries. Textual communication is, relatively speaking, very new as opposed to visuals, which we are wired to respond differently to after millions of years of evolution. 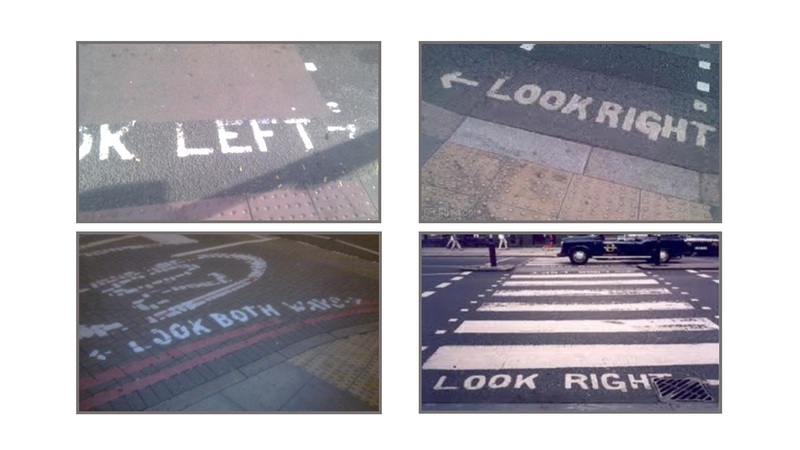 Our choice of a symbol on the road to replace the words ‘look left/right’ is rooted in the fact that visuals are processed 60,000 times faster than text, which is deciphered in a liner, sequential manner that takes time to process. In his book Symbol Sourcebook: An Authoritative Guide to International Graphic Symbols, Henry Dreyfuss explains that when he was an industrial designer he “tried to persuade some of [his] clients to substitute symbols for written captions on their products” to ensure safety. “A simple, quickly comprehended form or colour…is translated to the brain faster and more directly than a written word. In emergency or panic, the milliseconds saved in reaction time could save a man’s fingers, his arm, his leg, even his life”. Dreyfuss’s point is pertinent to our case. Using a tried-and-tested symbol for ‘eye’ with the universal sign for left or right (an arrow) to denote direction, is the best possible option for a simple, irrefutable road marking that facilitates the crossing of pedestrians to increase road safety. Research has found that humans are programmed to look in the direction that we see someone else looking in. This is what is known as cue gazing and it is a theory we can apply to our proposed design. Utilising a variation of Michael Posner’s cueing paradigm that assesses an individual’s ability to perform a shift in attention, Driver et al. conducted an experiment where subjects were presented with an image of a real face with eyes gazing either to the left or right. They were told that when the eyes looked to the left, the target would appear on the right 80% of the time, and vice versa. 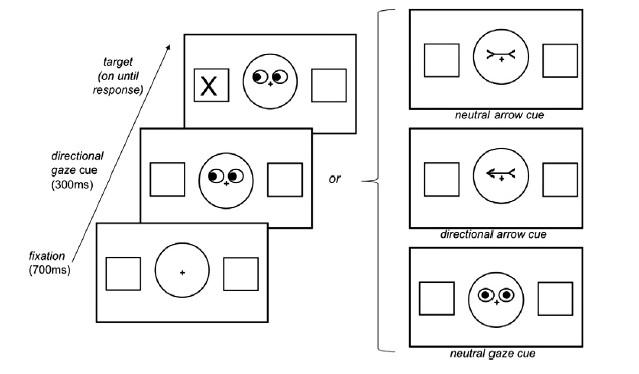 The results show that subjects looked reflexively at the gazed-at but unlikely target location faster than when the target appeared in the predicted, opposite direction. This short video is helpful in understanding the cueing paradigm. In other words, if a pair of eyes is looking in a certain direction, we are quicker to focus our attention on that same location despite being told that what we need to look at will appear elsewhere. This evidence makes a case for the proposed eye symbol road marking to be gazing in either a left or right direction. This would grab the pedestrian’s attention and focus it in the right location – that of oncoming traffic – without them having to think twice.